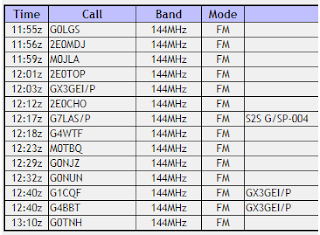 M0PLA/P SOTA Activations: 15th July 2017. GW/SW-041 SOTA Activation visit. Grid SO 255350 Altitude 703M. Today's SOTA Activation was going to be the Black Mountain on the edge of the Brecon Beacons National Park. We left home (Telford) at our usual 08:10 a.m. and headed south west towards Ludlow, then onto the A49 towards Leominster. Then eventually following signs to Hay-on-Wye, we eventually made it to our car park spot for today at grid SO 23954 37339. This is the car park for Hay Bluff, we managed to arrive at 10:10 am and just a quick warning when you turn left in Hay-on-Wye eventually you get to a choice in the road to go down two lanes to get to the car park, don't turn right as we did it looks shorter but is single lane all the way. We were lucky and didn't meet another car but if we had its a long way to reverse to passing points. From the moment you leave your car you are climbing, just follow the Offa's Dyke Path past the Hay Bluff summit stone and keep going. As you get to the top of the first rise just as you turn sharp left towards the Hay Bluff summit don't do what we did and try save 2 or 3 hundred meters of walking by going due East across the heather it is very hard going and lots of bogs (Bad Choice). Once past this summit the track is a gradual climb and very easy on the legs, there is one more part of climbing roughly half way to the summit but plenty of stone steps. The weather was kind in a way as it didn't rain but visibility was not great because of the cloud covering. I had left my HF mast and gear in the car as it was very windy (as seen above) so had decided on my hand held and my new 2M Yagi made from plastic conduit and 5 mm aluminium solid bar. The antenna had a good try out and I was getting some very nice reports. I had managed a S2S with G7LAS/P (Bob) on G/SP-004 Shining Tor (96 Miles). 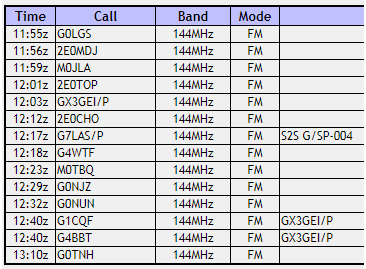 I had 14 QSO's with various new and old friends and made contact with GX3GEI/P a special event station hosted for a cub scout event, the contact was initially established with G4BBT (Roger). After I had finished my activation I heard them calling CQ and there was very little activity coming back to them so I decided to help them out. I held 5 or 6 greeting's with a few of the cub scouts and helped them get their communication 's badge I hope.